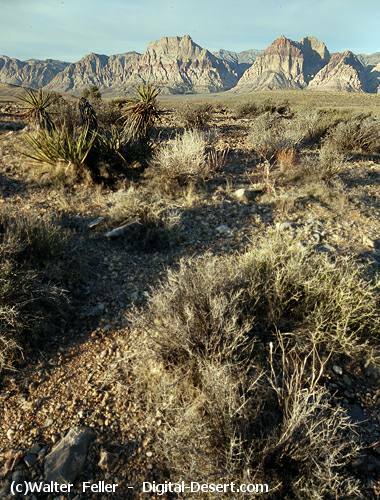 The land surface of the Red Rock Canyon NCA supports a wide variety of plant species. This variety is due to soil types and depth, elevation, exposure, temperature, precipitation, and existing and past use. pinyon-juniper; joshua tree; rabbit brush; oak brush; blackbrush; manzanita; desert shrub; barren and unique vegetation The following discussion describes each of these major vegetation types (BLM Range Inventory, 1979). This type lies between 5,000 and 7,000 feet and receives between 10 to 18 inches of precipitation a year. It forms a belt between the desert below and the true forest above. Precipitation is the first and soil shallowness the second limiting factor. The lower edge of the belt is occupied by juniper; but, at higher elevations pinyon pine and juniper intermix. At the upper edge of the belt, pinyon pine becomes prevalent curl-leaf mountain mahogany, big sagebrush and blackbrush are also found in this type in varying amounts. Three awn, Nevada bluegrass and cheatgrass make up the majority of the grass species present. This type can range between 3,400 and 9,000 feet elevation, but in this area it is found between 3,400 and 4,200 feet. Annual precipitation usually is low, ranging from six to eight inches. Rabbitbrush is generally found on eroded or disturbed soils along roadsides and in wash bottoms. It characterizes a soil with a relatively low alkali content. This type generally occurs from 4,000 to 6,000 feet in Red Rock Canyon NCA. Soils are moderately deep to deep. Precipitation is usually between eight and 10 inches. Sagebrush, manzanita, snowberry and rabbitbrush are some of the scrub species that also occur in this type in varying amounts. Nevada bluegrass, Indian rice grass and big galleta, as well as several annual grasses and forbs also occur in this type. Soil difference and soil moisture, as affected by slope and aspect (e.g.., north slope vs. south slope), probably account for the occurrence of oak brush . The blackbrush type is usually found from 4,000 to 6,000 feet elevation. Topography is usually steep to rolling and soils are very shallow to shallow, or two to 20 inches. This type is usually found in association with creosote, hopsage, sagebrush and wolfberry. Precipitation is fairly low, five to eight inches per year. This type is found in the area surrounding the escarpment in the rocky canyons and on the walls. Vegetation is found only on areas where soil has accumulated. The most limiting factor in this area is availability of soil. Precipitation usually ranges from eight to ten inches annually. Manzanita is the most dominant plant. Other species in this type present in varying amounts are: turbinella oak, cliffrose, desert barberry, desert ceanothus, snowberry, apache plume, juniper and pinyon pine. Various annual grasses and forbs also occur. The desert shrub type is found generally to the east of the sandstone escarpment. Precipitation ranges from 5 to 8 inches annually. Soils are generally shallow to very shallow. Species found in this community consist of Spanish bayonet, blackbrush, Mormon tea, Cheesebush, Spiny Menodora, Desert Almond, Sagebrush, Bursage, cholla cactus, dalea, turpentine bush and catclaw. Grasses commonly found include needle grass, sand dropseed and big galleta grass. This type is limited mainly to the deep, cool, well-watered canyons of the escarpment. These canyons, especially Pine Creek, Oak Creek and First Creek, provide a microclimate which supports small communities of ponderosa pine and several other species not commonly found at this low elevation. Some of these other species are: willow, serviceberry, snowberry, manzanita, sagebrush, black cottonwood and Gambel's oak. Nevada bluegrass, Indian ricegrass, blue grama and big galleta make up some of the grass species found there. In the past 40 years, many unique plants in the area have been subjected to heavy collection pressure. The sword fern, probably the most collected plant, has been reduced from large beds and glades to only occasional plants by trampling and collection. Other unique plants in the area include Agave (Agave utahensis nevadensis), a conspicuous part of the cliff community in the Spring Mountains and Charleston mountain pricklypear cactus (Opuntia charlastonensis) which occurs only in the higher elevation, wooded areas of the Spring Mountains.